During World War II, the 3rd Marine Corps built a small airstrip near Kamuela, Hawaii, consisting of a graded and oiled airstrip 3,000-feet long on land belonging to Parker Ranch. It was designed for use by liaison aircraft in connection with their training operations in Hawaii. This facility was known as Bordelon Field. The field was named for William James Bordelon (December 25, 1920 – November 20, 1943), a United States Marine who served in combat during World War II. During the Battle of Tarawa, he was killed in action while he led the assault on the enemy and rescued fellow Marines. For his acts of gallantry, he was posthumously awarded the United States’ highest military honor — the Medal of Honor. He was the first U.S. Marine from Texas to be awarded the Medal of Honor for action in World War II. In order to provide air service to the Waimea district after the war, the area on which this airstrip was situated was leased from Parker Ranch by the Hawaii Aeronautics Commission and renamed Kamuela Airport by Act 32 of the 1947 Legislature, effective July 1, 1947. 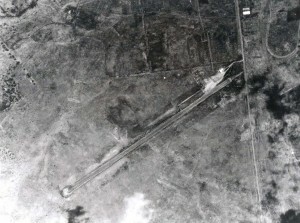 The 1947 Territorial Legislature appropriated $60,000 for the development of this field, but the construction necessary to develop a field in this area with sufficient length to meet scheduled airline operation using DC-3 type of aircraft required an expenditure of several hundred thousand dollars. Engineering studies were made to determine the most economical method whereby a field could be constructed in this general area which would conform to scheduled airline operating requirements. In 1949 the Legislature appropriated $200,000 for paving, grading and improvements. The community was desirous of a satisfactory airport in this area, not only for the convenience of the travelling public but for the transportation of produce from this area to the Honolulu market. Extensive studies were conducted with regard to the further development of lands for increased production of farm commodities and if the community were assured of prompt delivery of its goods to the local markets, the air freight carriers alone would be the major users of this field. 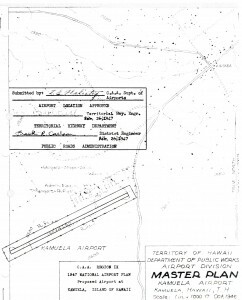 The HAC approved $58,000 for repairs to Kamuela Airport in July 1950. 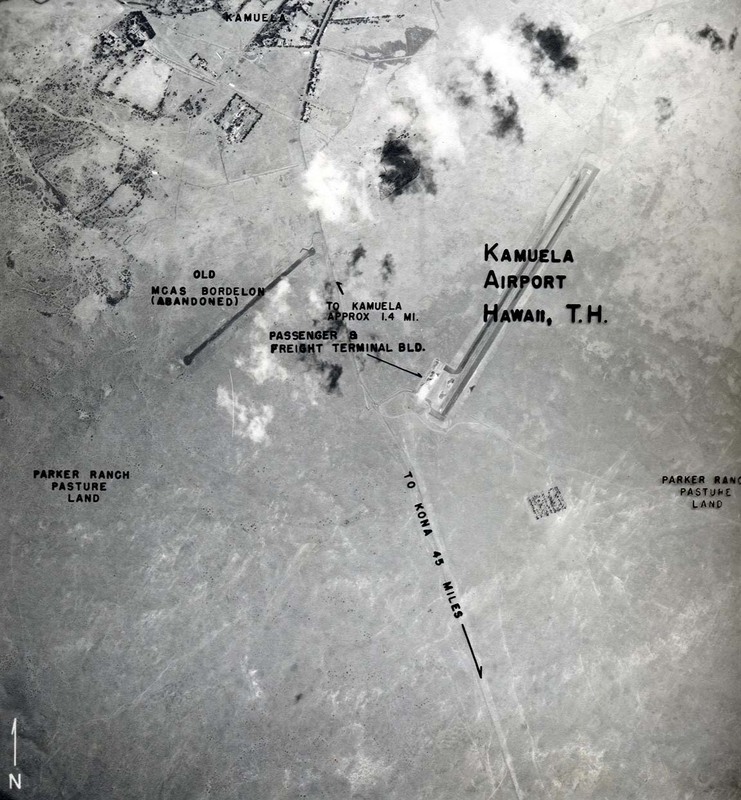 The HAC agreed to an extension of the lease for Kamuela Airport beginning November 4, 1950. Approval was also given to make repairs to the runway. 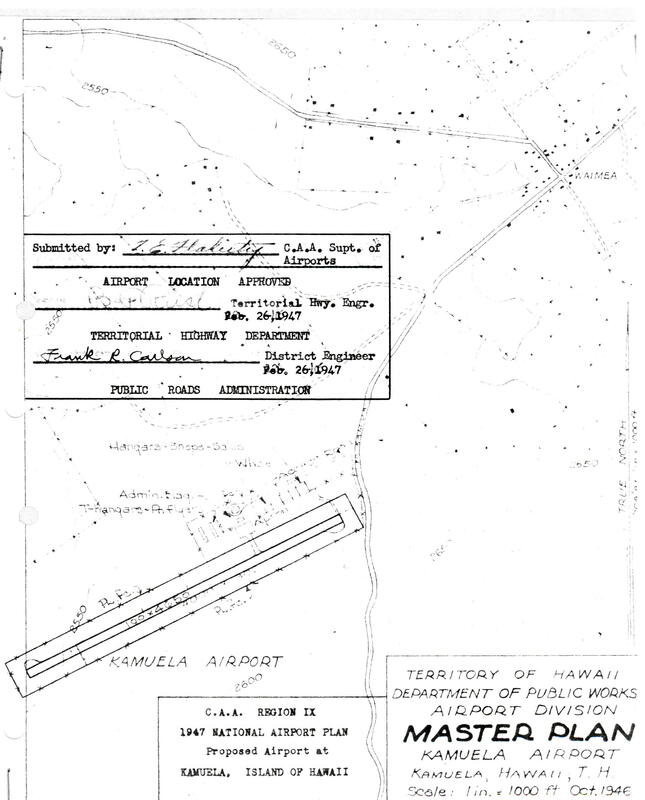 In 1950 Kamuela Airport was deemed unsuitable for development as a modern airport. Studies of terrain and weather were conducted to find a suitable site for a new Kamuela Airport. 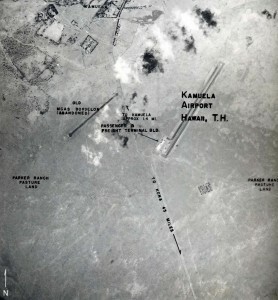 Repairs to the old Kamuela Airport were completed and the airport reopened on December 22, 1950. In January 1951, the field runway was widened by 16 feet and completely resurfaced at a cost of $17,198. Office space was rented to Cockett Airlines at a rate of $1.00 per square foot per annum, which conformed to the rate charged at Port Allen for like facilities. Act 63, SLH 1951, approved May 10, 1951 ratified an agreement between Hawaii County and the HAC to provide the labor and materials necessary to repair the surface of the airplane landing field. The HAC would reimburse costs. On October 22, 1951 the HAC approved a sum of $728,000 for the development of a new runway at Kamuela to accommodate freight planes and Convairs. The airport was served by daily (except Sunday) scheduled freight flights and non-scheduled passenger planes in 1951. It did not meet the requirements for scheduled passenger service. The airport ranked very high in the Territory as pertains to amount of freight shipped by air. Routine maintenance and custodial duties are performed by one full time HAC employee. Kamuela Airport was inactivated in August 1953 due to the opening of the new Waimea-Kohala Airport near Kamuela town.